Many of us, myself included, spend a lot of time trying to figure out God’s plan for our lives. What is his purpose for me? Where does he want me to go? Basically, why am I here and where am I going? I must confess that from time to time, I get a bit obsessive about these questions. In Exodus 12-14, as God brought Israel out of Egypt, I imagine they had some of these same concerns. They knew God had promised them a good and broad land, a land flowing with milk and honey. But where was this land? How were they going to get there? What exactly was God’s plan for their lives? While Exodus 14 presents a narrative account of the Israelites’ escape through the Red Sea, Exodus 15 presents a song expressing wonder, awe, and praise for God’s actions on Israel’s behalf in their escape from Egypt and looks forward to what he is going to do for them. Exodus 15:13 portrays God’s plan for Israel as the Lord guiding them to the place of his holy habitation by his strength. The Hebrew word for “guiding” here arises out of the language of shepherding. 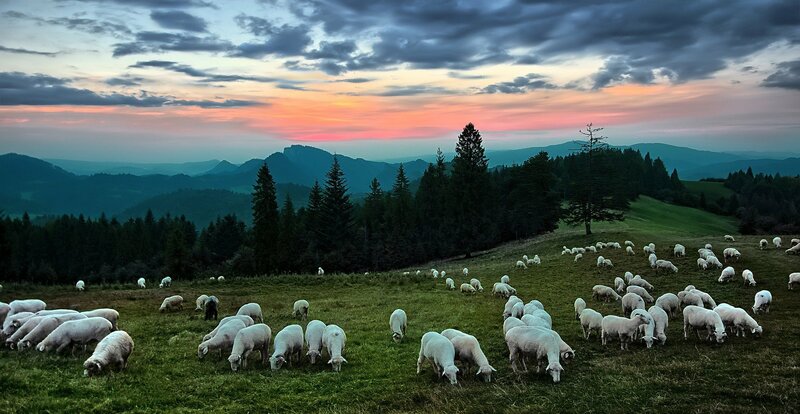 It connotes the idea of leading sheep with great care to a watering place—a place of refreshment and rest. The place to which the Lord guides is designated by a Hebrew word that points to a place where the sheep lie down, rest, and feed, and are afforded safety, protection, and security by the strength of the shepherd. And it is often also the dwelling place of the shepherd himself. Exodus 15:17 further develops this picture by describing the Lord bringing his people to the mountain of his inheritance, the place he made for his dwelling, the sanctuary his hands established. And he not only brings them there, but he plants them there. Their roots can grow deep and they can flourish, resting securely and firmly because of the tender, watchful, loving eye of the Lord. The Lord’s plan for his people, then, was that they follow his guidance and leading, carried out with great care for them and concentrated attention on them. The place he is guiding them to is a place where they can find food and water, rest and peace, safety and protection. But above all it is a place where the Lord dwells. His plan is for his people to join him where he is and to be with him there. When I seek the Lord’s plan for me, I am usually focused on figuring out what he wants me to do. But the Lord is focused on relationship. He wants me to be with him and dwell with him. That is his purpose for me; that is his plan for me. When I am doing that, the blessings are many. I am protected and provided for. I am secure in his love. But these benefits flow out of being with the Lord, knowing that he never leaves me. Trying to figure out what I’m supposed to do and where I’m supposed to go is seeking the benefits, rather than the Benefactor. My goal should be to follow his presence, knowing that he will guide me to himself. There are incredible riches there, but they are gracious gifts, not earned rewards. How have you gone about trying to figure out God’s plan for your life? How does your process compare with God’s process as outlined in Exodus 15? Joy Mosbarger serves as a mentor with The Leadership Institute, primarily mentoring women who serve as leaders in various church and parachurch ministries. She is an Adjunct Faculty member at Talbot School of Theology and writes for Talbot's Good Book Blog. Joy has received her Ph.D. in Old Testament from Fuller Theological Seminary, where her focus was on Old Testament spirituality. For twelve years she was on staff with Campus Crusade for Christ (Cru) working in Campus Ministry and with the Church Dynamics Ministry.